My mum made this last weekend and it was perfect for the early spring sunshine – light, but also satisfying. And most importantly, it gives that feeling of wellbeing that a good salad should give. I’ve changed the ingredients a little as I didn’t want to put potatoes in as she did, but it’s still quite delicious. First, grill the chicken and courgettes. I used a George Foreman grill which speeds up the process, but if you don’t have one use a stove-top griddle or your oven’s grill. Grill the chicken for 5-7 minutes, until cooked through, and then set aside to cool and then finely slice. If using a George Foreman, clean it down before putting the courgettes on, and then grill the courgettes for approx 5 mins, until soft and with an attractive chargrill pattern on the top. Put some water on to boil and when ready, boil the green beans again for 5 minutes. When cooked, run under cold water until the beans are cool to prevent discolouration. 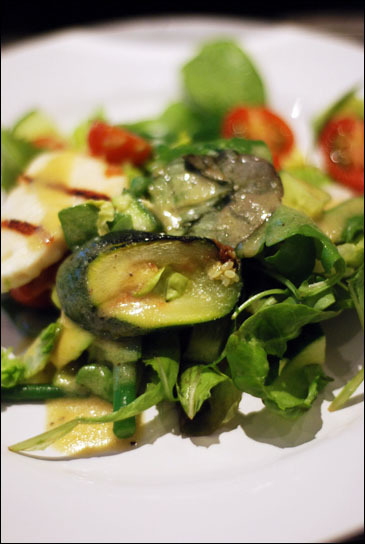 Put the baby leaf and gem lettuce in a large bowl, along with the cooled beans, courgettes, chicken, cherry tomatoes, avocado and courgette, then, making sure the Foreman (or grill) is clean, grill the halloumi (this can also be done in a dry frying pan) until it turns slightly soft. If grilling using a dry frying pan, turn half way through cooking (after about a minute). Toss the salad, add the halloumi and dress with vinaigrette to taste. I put the vinaigrette on once I’ve served the salad so that any leftover leaves won’t wilt.